Transparent cassette with blue type in a custom card picture box. 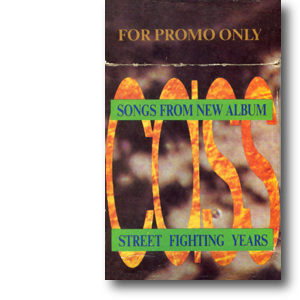 This custom promotional cassette carried four tracks from the album. It was housed in a unique "cigarette box" style card sleeve with a lid that hinged open. It also had its own unique colour sleeve. Unfortunately no mint copies have ever surfaced. All the copies I've seen are badly scuffed at the edges and the delicate boxes have been slightly crushed. 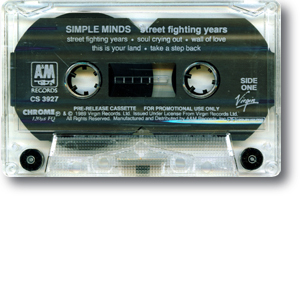 Street Fighting Years is mistakenly labelled Street Fighting Man on the cassette itself. It used to be scarce but most copies are now in collections so copies now rarely surface. Virgin Australia also produced a similar promo for Real Life. Transparent cassette with black type. No sleeve. This promotional cassette of the album is now extremely rare. It includes the text "Pre-release cassette. For promotional use only" along the base.